When you buy an American-made Cotterman Ladder you buy superior, time-tested craftsmanship and solid safety. National Ladder & Scaffold Co. knows Cotterman best and we’ll direct you to the Cotterman Ladder that works best for you. Plus, every Cotterman Ladder is given a top-performing zinc-rich primer and gray powder coat finish which prevents corrosion and makes your Cotterman Ladder outlast other brands. Built for your safety and ease-of-use the Cotterman Ladder is made for easy rolling from job to job, making your job easier. Every Cotterman Ladder has comfortable climbing steps with easy climbing angles ranging from 50 to 59 degrees. Sturdy 30” high handrails and large steps with no-slip great grip add to your maximum stability. Right, left or double handrail arrangements suit your work needs and add extra stability. Cotterman’s Safe-Lock, locks your ladder’s 4” wheels in place, keeping your ladder absolutely stable while you’re on it and saving you from accidents. Let us help answer any questions you have about a Cotterman Ladder and call us at 1-888-725-5995 to have our experts at National Ladder & Scaffold Co. advise you on your choice of Cotterman Ladder today. Performa Perforated: Ultimate traction, outperforming in slip-resistance all other designs now on market. Available on ladders 18” and 26” wide. Rubber Tread: Non-slip ribbed rubber tread on a solid metal step. Designed for office use. Deep Top Step: Affording you maximum space and stability, at 20” deep or 30” deep. Your many other customizable options include handrail features, ladder maneuverability upgrades, and more. Free of charge, coat your Cotterman Ladder with your pick of 12 colors in durable high gloss powder coat finish in red, orange, green and more. Cotterman’s powder coating is environmentally friendly, emitting no harmful chemicals and no hazardous waste—a plus for sure. All just another example of Cotterman’s dedication to through-and-through absolute excellence in every aspect of a Cotterman Ladder. 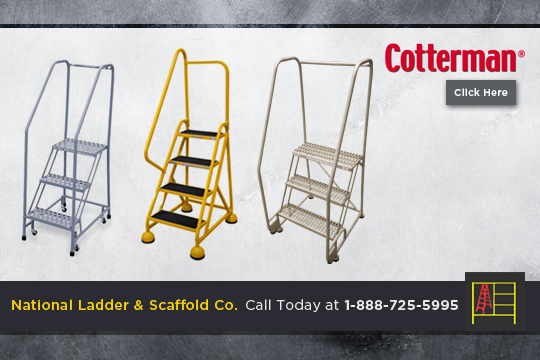 When you call 1-888-725-5995 National Ladder & Scaffold Co. helps you find the right customization for you, making your Cotterman Ladder order as easy as possible. Made entirely in America, a Cotterman Ladder carries the American heritage of craftsmanship and making great products built tough, always practical. Cotterman Series 2600 is a superior line of steel safety ladders designed and constructed for extra heavy duty use, with extra bracing and heavier materials to resist damage. Series 1000, the flagship Cotterman Ladder line is more for an everyday use ladder, with dependable durability and simple ease-of-use, it’s the best-selling Cotterman Ladder. Customers know top quality and proven results when they experience it first hand and that’s the experience you receive with National Ladder & Scaffold Co. Nobody knows the ins and outs of a Cotterman Ladder like National Ladder & Scaffold Co. and we’ll make sure you get the most benefit out of your Cotterman Ladder, tailoring it exactly to your needs. Call National Ladder & Scaffold Co. today at 1-888-725-5995!